It’s the season.... to detox my skin! I haven’t even made it to New Year’s and my skin is looking tired and dull. 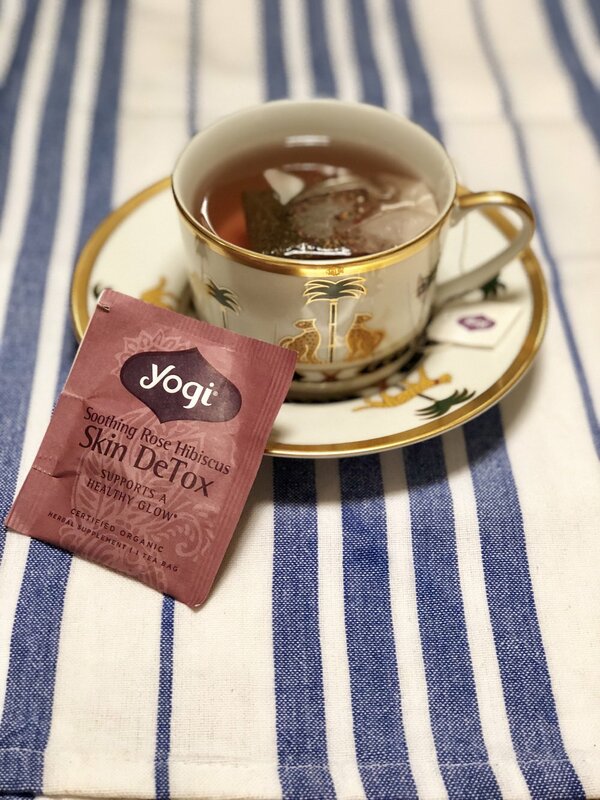 Nothing relaxes me and my skin more than a cup of Yogi Soothing Rose Hibiscus Skin Detox. Made with Rose Petals and Hibiscus to sooth the skin and Dandelion, Burdock and Yellow Dock, to cleanse, your skin reveals its most natural and relaxed glow. While hydrating me, something I always need, the teas ingredients work to pull impurities from my skin and liver and deliver antioxidants. The light floral flavor is so relaxing to smell and sip and the green tea gives me that little extra boost I need to get everything done (especially around the holidays). Yogi Teas are well know for there large selection of flavors which use Ayurvedic principles to formulate teas for well-being. Detox, Bedtime and Stress Relief are some of my favorites, but there are endless beneficial flavors. If you are what you eat, then I want to consume as much as I can to make me look and feel healthy, happy and beautiful for 2018.